The Ultimate Lineup Shops at Pomegranate – The Pomegranate Commercial! One of the most intriguing albums that came out recently is the Shir “Shmitah benefit” album released by Shlomo Yehuda Rechnitz. A lot has been written about the generous philanthropy of the Rechnitz family and specifically Shlomo Yehuda, so I am not even going to try to tackle that aspect of the album. The Rechnitz family is well known in the Jewish Music world as talented composers and sponsors of many musical productions in the LA area. Music runs in their family and in fact their mother is an accomplished pianist (this is what my Rosh Hayeshiva said publically and I had no reason not to believe him and I also see it mentioned in the PDF cover of the album as well). Music is like the blood in their veins and for Shlomo Yehuda to be able to put out a production like this is really something I am personally jealous of and hope to be able to do myself one day. Reviewing an album like this is very challenging because of all of the singers and arrangers involved, but I am up for the challenge. I must say that producers Yossi Rubin and David Fadida did an amazing job matching up songs and singers. Yemaleh Pi – I am not sure how to categorize Levy Falkowitz’s voice but one thing I can tell you about him is that he is an extremely versatile singer. I have heard him singing various styles on different albums and he sounds very comfortable with whatever style he’s singing. This song, arranged by the talented Yoeli Dickman, starts off with a “chazzanishe” intro but is really a disco styled song that is a very pleasant and melodious song. What a great way to start off the album! Vesai’ureiv – This is one of the songs that debuted at wedding of Shlomo Yehuda’s daughter. The song is performed by Mordechai Ben David and up and coming star Motty Steinmetz, who sang the song at the wedding and is arranged by Moshe Laufer, who also conducted the band for this song by the wedding. It’s a beautiful and hartzige song that was well known even before this album was released. Menagen – Shloime Daskal is one of the most sought after singers today in the Jewish music wedding scene and listening to this song shows just way. There’s a power and sweetness to his voice that isn’t common. This lebedik song is beautifully arranged by Moshe Laufer and the choir arranged by Zevi Fried really enhanced the song. Hanaar Hazeh – This song was performed and released in honor of the bar mitzvah of Shlomo Yehuda’s nephew. The Shira Choir along with Moishe Mendlowitz, Levy Falkowitz and Motty Steinmetz do a real justice to this hauntingly beautiful song. U’re’aih Bonim – Moishe Mendlowitz has been out of the Jewish music scene for a while. I really only have two words to tell him. Welcome back. What a voice and what a talent. This upbeat freilich permeates happiness and Moishe’s vocals really make this song very enjoyable. Ki Besimcha – Itzik Dadya and Uzia Tzadok are two Israeli singers who are on the younger side and both relatively unknowns (at least by me) but listen to this soul wrenching duet (Shlomo Yehuda’s words) and you’ll agree with me that they will one day be household names in the industry. Eitz Chaim Hi – This song was introduced to the world a few years ago at an LA Simchas Bais Hashoeva (https://www.youtube.com/watch?v=NVN6ek7QiwA) and has been performed many times since then. On this album, Mordechai Ben David and Motty Steinmetz team up once again and really do this amazing song justice. Rachem B’chasdecha – Ah….Avraham Fried! Who else can put so much warmth and feeling into a hartzige song dedicated to all the yidden of Eretz Yisroel. This is another beautiful slow song on the album and I especially appreciate the harmonies that Avremel sings with himself. Lo Yisa Goy – In case anyone wasn’t sure if Shlomo Yehuda composed songs in various styles, this song confirms that he can. This song can only be classified as “Lipa style” song…and what a surprise….Lipa Schmeltzer sings it! Lipa, with the help of the amazing arrangements of Yoeli Dickman really work magic on this song. Shomer Yisroel – This song was originally released when all Klal Yisroel was davening for the 3 kidnapped boys in Eretz Yisroel. I really like how Shlomo Yehuda incorporated some of the Israeli talent that is lesser known here in the US. Uzia Tzadok’s voice is so pure and sweet and really takes this song to a different level. Elokei – This swing styled song is performed superbly by Yoely Greenfeld. I have reviewed both of Yoely’s albums and also the Beats album that he is featured on and so it is very well documented how much I like his voice and his music. This song fits right in with his style and I must say is a real diamond of a song on an album filled with diamonds. 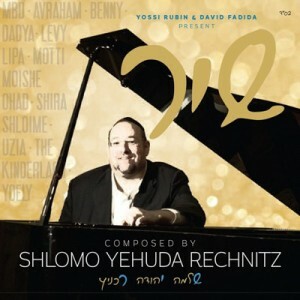 Yehi Ratzon – With words from Neilah, this haunting song is enhanced by Shlomo Yehuda and MBD singing. The song originally composed in memory of a piller of the LA community, and the emotions this song conjures are very much felt throughout the song. Hinei Hinei – This song, also originally introduced to the world at a LA Simchas Bais Hashoeva a couple of years ago (https://www.youtube.com/watch?v=06Ks-eC5VQc) has quickly become a hit by weddings all over. Benny Friedman has the zchus to sing this song and he does an amazing job. I am a huge fan of Benny’s and his range is really on display on this song. It really makes an awesome song even awesomer (yeah I know it’s not a real word). I also think Yoeli Dickman does an amazing job with the arrangements on this song as well. V’ airastich – This song, also a big hit at weddings, was originally performed by Shlomo Yehuda’s long time friend, Moishe Mendlowitz at Shlomo Yehuda’s daughter’s wedding and he also sings it on the album. Moshe Laufer, who arranged and conducted the song by the wedding and I believe the same arrangements are used on the album as well (if not exact then pretty close). As I mentioned earlier, I love Moishe’s voice and he nails this song down perfectly. Ko Sevarchu – I am not that familiar with the work of The Kinderlach however from my recollection, this is not the typical style they sing. This is a beautiful “oompah”/disco style song that I believe brings out the sweet voices of the Kinderlach. The song is arranged by Israeli duo Eli Klein and Yitzi Berry (Suki’s son….the apple doesn’t fall far from the tree). Beshem Hashem – Once again, Motty Steinmetz lends his unique and amazing voice to another gem of Shlomo Yehuda. This hartzige song is also dripping with emotion and reading that it was composed after a kumzitz with parents of children who were nebech sick. Uvechanuni – This lebedik horah really fits the style of Ohad, who sings it on the album. I really like the arrangements of this song all the way around (another shout out to the Israeli duo of Eli and Yitzy) and Ohad is…well, Ohad! Mi Adir – While this song is not composed by Shlomo Yehuda, it is included on this album because Shlomo Yehuda’s younger brother sings this at his friends’ weddings and it’s a beautiful song. Itzik Dadya sings it on his own album and rerecorded it for this album as well. It’s a beautiful ending for a beautiful album! In conclusion, not only is this an amazingly beautiful album filled with awesome songs and a ton of Jewish Music talent, but it’s also benefitting a very worthwhile cause and organization. If you don’t already own this album do yourself and the shmittah keeping farmers a favor and buy it either at mostlymusic.com or wherever quality Jewish Music is sold! #3 the song shomer was composed (in LA) on purim about 4 years ago (i was there) with MBD, Shira choir and Yoely Greenfeld @ the purim seuda and not like u said “when all Klal Yisroel was davening for the 3 kidnapped boys in Eretz Yisroel,” Rechnitz put it out then, but it was around way before then.